Whether it’s a shackle, a hoist, a crane, or a beefy fly frame, never forget that everything breaks. The only question is under what load and under what conditions. To address this issue, the rigging industry has adopted the term “SWL,” which stands for Safe Working Load. You might also see “WLL,” which stands for Working Load Limit. When you purchase a shackle, a pairing ring, or a length of wire rope, they’ll all carry a load rating – unless they are cheap copies of the real thing (more on this later). Let’s start with the common anchor shackle. An anchor shackle is the bread and butter of the entertainment rigging industry. It can be obtained in many sizes, and made from several types of material. It’s close cousin is the chain shackle, which normally carries the same ratings for a given size, but is not as commonly used (Figure 1). The stated size of a shackle relates to the nominal diameter of the threads that secure the pin into the body of the shackle. The unthreaded section of the pin will always be larger in diameter. This is important to know if you’re building a steel frame or fixture that the shackle will attach to. A 1/2-inch shackle will need a hole diameter of at least 5/8 of an inch or larger, to fit without jamming. 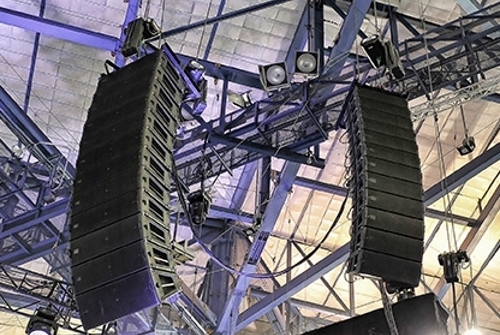 Loudspeaker rigging mainly utilizes shackle sizes of 1/2-inch, 5/8-inch, and 3/4-inch It’s rare to encounter any that are larger, though smaller ones are sometimes seen for light loads. But what does this mean precisely? Can you load them up to their stated rating? Absolutely not! Most ratings, especially of older products, are based on a 4:1 safety margin. This was the safety standard that was used in the crane and rigging industry for many decades. Some newer parts may be rated at 5:1, or an even higher ratio, but you can’t count on it unless it’s clearly notated on the part itself, or the spool it’s wound on (for wire rope). Nonetheless, in our industry we have to go further. We don’t use shackles on construction sites with trained crane operators and ground-personnel – all working with a constant awareness of the possibility of a shackle or a cable failing. No. Instead, we suspend loads over people’s heads who are paying attention to anything but the loads we suspend in the air. They’re looking at the stage, they’re dancing, they’re socializing. Entertainment rigging has largely adopted a 7:1 safety margin in the U.S., while in the European Union, the safety margin is mandated at 10:1, usually followed in most countries. At a 10:1 ratio, if the failure point (also called “ultimate strength”) of a shackle or other device is 10,000 pounds, then you should never load the device to more than 1,000 pounds. And even that rating, gentle rigger, is only valid under a static load. A dynamic load, which occurs when a chain motor starts and stops – or a gust of wind hits – can put a far greater force on the suspension equipment than that of a static load. And then there’s material fatigue. The shackles and the wire rope slings you routinely grab from your rigging box are all not necessarily created equally. Shackles are designed to be loaded in a straight line; they should never be turned sideways (Figure 2). While this isn’t breaking news to anyone, it’s not so well known that bridling two wire rope slings, or two Spansets in the eye of a shackle, is NOT what a shackle is intended for. Yes, you can do this and usually get away with it, but it can weaken the shackle’s ultimate strength by a considerable margin. The weakening is a function of the angle of the bridle: the more acute the angle, the more the shackle is being pulled in multiple directions and therefore weakened. The proper method is to use a pairing ring. In Figure 3, the vertical arrows represent the vector force within the shackle, while the angular arrows represent the actual force when a shackle has been subjected to a semi lateral line-of-force. Anchor shackles may look like they’re designed to take angular loads, because of the way they conveniently flare out in the top part of their eye, but they are not! They are intended for straight line-of-force loads only, or at best, very shallow bridle angles. Some shackles, usually those of very high quality, will be imprinted with marks that represent the maximum permissible vector loading. In such cases, it may be O.K. to utilize a shackle as a pairing ring, but only when a shallow bridle angle is presented. Only the highest quality materials and components should be used in any entertainment rigging application. All reputable manufacturers of rigging components employ scientists, metallurgists, and engineers to ensure that their products are designed properly, manufactured uniformly, and will reliably meet their stated load ratings. They use standardized test procedures, proven over decades, to ensure quality and reliability. Conversely “copy cat” manufacturers often do nothing to ensure safety. In these modern times of international trade, thousands of suppliers exist that sell cheap parts that may closely resemble the originals they’re based upon, but these suppliers sometimes have little to no regard for meeting any stated rating – if they state it at all. Such products, which are found many places, including local hardware stores, are unsafe and can fail unexpectedly. Do not purchase them. If this article can convince you of anything, please let it convince you to purchase only the highest quality parts, materials, and components. The money you’ll save in the local hardware store for a length of wire rope, or a handful of shackles, will not pay for even one hour of legal representation. Are you with me so far? Reputable companies such as The Crosby Group have been manufacturing high quality components in the U.S. for many decades. They publish meaningful manufacturing data, and they stand behind their work. Numerous other companies, domestic and abroad, also meet high-quality standards. Seek them out. Establish a commercial account with a suitable supplier, especially if you intend to become a regular customer. If your usage is sporadic, consider using a distributor like McMaster-Carr, Grainger, or another industrial supply house. Don’t be afraid to speak with the sales department and demand – yes demand – the material data sheets on each product that will let you sleep well at night. If your supplier can’t provide the information that you request, find another one. At all costs, do not accept off-shore substitutes that may look the same as an engineered product, but might possibly perform at a far lower standard. If you purchase your parts and materials from a manufacturer who routinely performs proof-testing of batch samples, rates them accurately, and is willing to publish comprehensive test data, then you can’t go wrong. You’ll pay more for such parts, assuredly, but the life you save might be your own. Shackle bodies are typically forged, quenched, and tempered, and supplied with an alloy-steel bolt. While we’re not going to get into metallurgy, suffice it to say that forged steel is very strong, but also rather brittle. Think of it as the opposite of sheet metal, which is highly ductile. When you drop a shackle – and that’s a pretty easy thing to do – the brittle steel can become invisibly fractured from the impact of the fall, reducing its strength considerably. If you’ve ever seen a shackle explode under load, you’ll recognize the wisdom in discarding a shackle, or other forged part, that may have been inadvertently damaged. For this reason, always carry numerous spare parts to your gig. You can’t replace the dropped shackle if there’s no others left in your rigging kit. And as “DeLoria’s Shackle Dropping Law” states: After you’ve dropped one shackle, you’re likely to drop another a few minutes later. The mechanical properties of steel when a load is repeatedly applied is known as its fatigue strength. Fatigue testing determines the ability of a material to withstand repeated applications of a load. The load by itself may be too small to produce a failure. 3) The number of cycles at which the fitting fails. One accepted method of fatigue rating fittings is to test them to one and a half (1-1/2 times the working load limit for 20,000 cycles, without failure. This standard test is accepted as indicating indefinite life when used within the working load limit under normal circumstances. Two of the most misunderstood aspects of rigging are reeving and bridling. I’ll go into further detail about both of them next time, but must state this now: Never, ever reeve a Spanset, wire rope, or other suspension device through eyebolts, shackles, or other supporting points (Figure 4). Unfortunately, and for reasons that elude me, such practice is very often seen. There is never any legitimate reason to reeve suspension points when you’re rigging loudspeakers for public usage. Reeving can be useful on construction sites, when the load needs to be shifted to align with some other fixture, but should never be used in the sound reinforcement industry. A reeved attachment will always significantly increase the load on the parts that are used in the suspension system. The additional load incurred from a reeved attachment can far exceed the weight of the suspended object itself. This is a simple function of the vector forces involved, which in turn are a function of the geometry of the reeve, but often may be difficult to understand due to the counter-intuitive nature of vector geometry. Similarly, bridling, especially at acute angles, will put far more stress on the rigging components than the actual weight of the load itself. This is also counter-intuitive, and perhaps equally difficult to comprehend. Nonetheless it is true. In the next installment, I’ll show exactly how reeving and tight-angle bridles magnify the load on the various components that are intended to keep your rig from plummeting to the ground. In the meantime, stay safe out there.